Zell am See is a town in the Pinzgau region of Salzburg. It is well-known as a stylish, late 19th century holiday lake resort and forms an advertising community with nearby Kaprun for the travel destination Zell am See - Kaprun. Zell am See is also a county town, which makes it an educational, economic and administrative centre for the region. It can be found in the south of Salzburg and offers good access to a couple of skiing areas (such as Saalbach-Hinterglemm, the Kitzsteinhorn or Kaprun) and the National Park Hohe Tauern if you prefer a summer vacation with hiking. The lake itself is suitable for swimming during the summer. There are boats for cruises available and a ferry to Thumersbach. On contrast to many smaller towns in the region, which have often grown tremendously after WWII due to the rise of tourism, Zell am See has been a significant town for a long time. This can be seen in the (pedestrianised) historic city centre, a Medieval tower and a Gothic parish church that add greatly to the appeal of Zell. The village became a market town as soon as in 1358. In 1875, Zell am See was connected to the rapidly growing railway network of the Austrian-Hungarian Empire and soon developed a reputation as a holiday destination. 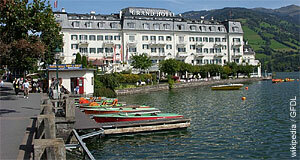 Many buildings like the Grand Hotel of Zell am See or the lakeside promenade date back to the fin-de-siecle area. If you are interested in the history of Zell am See and the Pinzgau region, go to the small Heimatmuseum or town museum there. There you can also learn a great deal about pagan traditions in the alpine regions of Salzburg, the famous Perchten. The lake by which the town can be found is called "Zeller See”. Factoid for the Sound-of-Music fans among our readers: The Trapp family used to spend their summers in a holiday cottage in Zell am See. Today, it is rather the skiing that draws the crowds to Zell am See and the Schmittenhöhe skiing area. This is not limited to the winter season: The glacier on the Kitzsteinhorn offers good facilities for summer skiing, one of the best in Austria. There are three major cable cars in the immediate surroundings of Zell am See: The Zeller Bergbahn on the Hirschkogel; the Schmittenhöhebahn; and the Sonnenalmbahn. All of them are suitable for hiking and skiing. A visit to Zell am See can be combined with a trip to the National Park Hohe Tauern or the Großglockner Hochalpenstraße.